During March and April, the eventual runoff is still locked in the snows of the high mountains, and the lake, bereft of this inflow, has dropped to its lowest level of the year. This is the time to revel in low–water delights: things either unseen or merely glimpsed at for the rest of the year. Beach–walking is now particularly grand: the snow is gone from the sand; valley temperatures are comfortable; birds have begun to sing and mate; human visitors of summer are far off; and there is a broad expanse of interesting terrain to explore. But, what is there to discover? Obvious candidates are the various man–made structures from the past which only now become revealed. Yet, there are less obvious delights, such as the mud beyond the beach sand. Why is this mud so characteristic of low water? And even if the presence of mud holds no charms for some, there are the inevitable animal tracks found in that mud which reveal that life along the lakeshore goes on night and day. The examples I present below, I am sure, speak to my own limited observing skills. Please write and tell me of your favourites, so this list can expand. There is a distinct bias in this material towards the West Arm. In part that is because that is where I live, but, it is also the case that the West Arm has the shoreline shallows which facilitate interesting low–water features. And yet, I suspect that these examples merely hint at the interesting things to see during the month or so when the Lake is low. 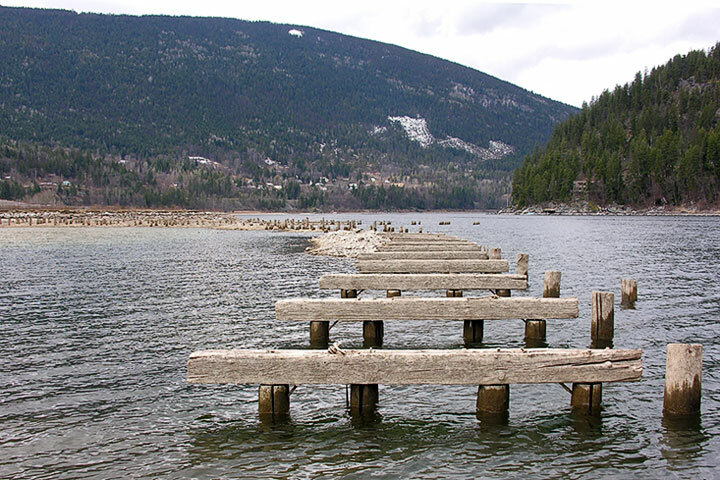 The wreck of the sternwheeler, S.S. Kuskanook, lies at Kokanee Landing which is located at the bottom of the access path which would correspond to about 5176 Kokanee Landing Road (about 20 km from Orange Bridge and a few tens of meters east of the Kokanee Creek Marina). The Kuskanook (Ktunaxa for “end of lake”) was launched in 1906. 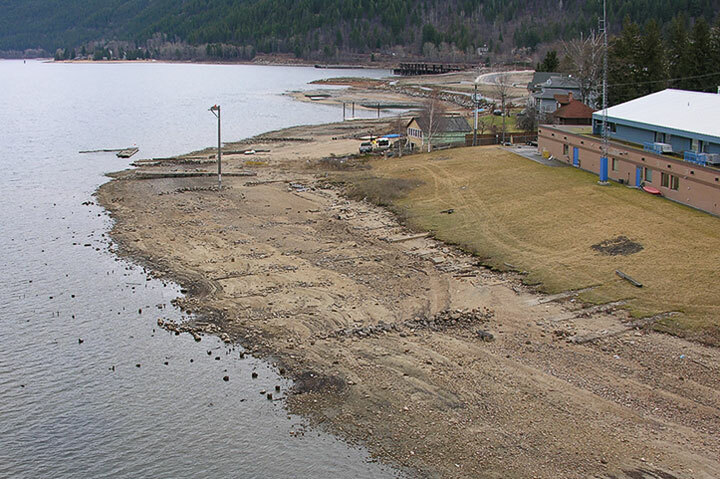 The vessel was sold in 1936 and moved to Kokanee Landing where it was dismantled. Parts of structure were transformed into nearby summer cabins; the wheel was split to make headboards; the hull was stripped of machinery. This, and the Hosmer, are two of the great wrecks on the Lake from the age of steam. While March is a good time to visit the Kuskanook, it is too early to find an osprey occupying its nest on the piling. On the beach in front of the RCMP building (and immediately east of the bridge) lies the cement foundations and some pilings of the ways at the Nelson Shipyard: the dry dock where many of the sternwheelers were built and launched. The heyday of the CPR Transfer Wharf was the 1890s, prior to the building of the rail line along the West Arm. 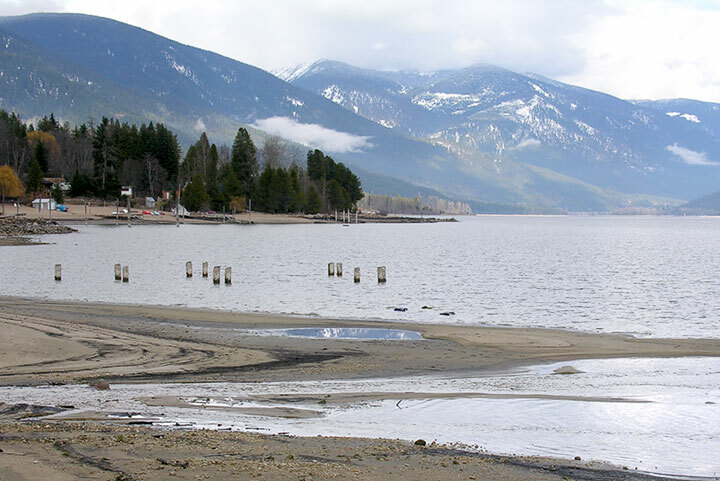 It then provided a transfer point between trains and sternwheelers running between Nelson and Kootenay Landing at the south end of the Main Lake. It is located alongside the Nelson Airport. 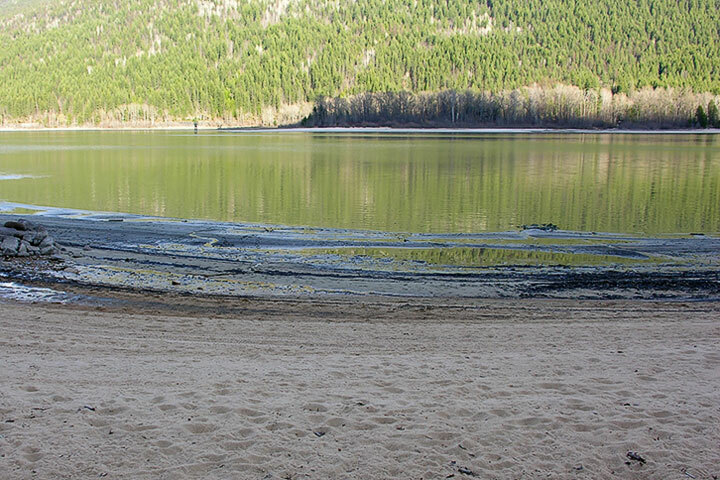 At low water, mud is often revealed below a sandy beach. Indeed it seems that the better the sand, the more copious the mud. To understand this, one must look to the waves of summer. When a wave breaks on the beach, it picks up and moves sand and silt, both pushing it up the beach and carrying it out into the shallows. But, the water velocities in the wave decrease away from the water’s edge and so only the smallest particles can be supported and moved well out. This sorting of particles by the waves leaves the biggest particles (sand and pebbles) close the the water’s edge and the smallest ones, which form the mud, somewhat farther out, but laid bare at low water. The mud of low water is a slate upon which animals leave a record of their passage. 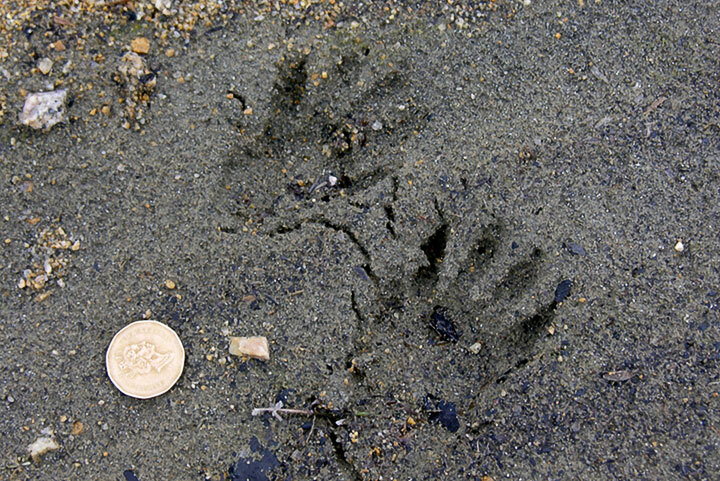 These are the tracks of the water–loving raccoon, but also look for deer and geese. This former landing sits just adjacent to the mouth of Shannon Creek (across the Lake from Troup). Was it the landing for Ferndale Park, which thrived beside the creek from 1906 to 1914? In the late 1940s, rather than remove the pilings they were cut short (alas, a common practice), with the result when the water comes up they present a hazard to boats. 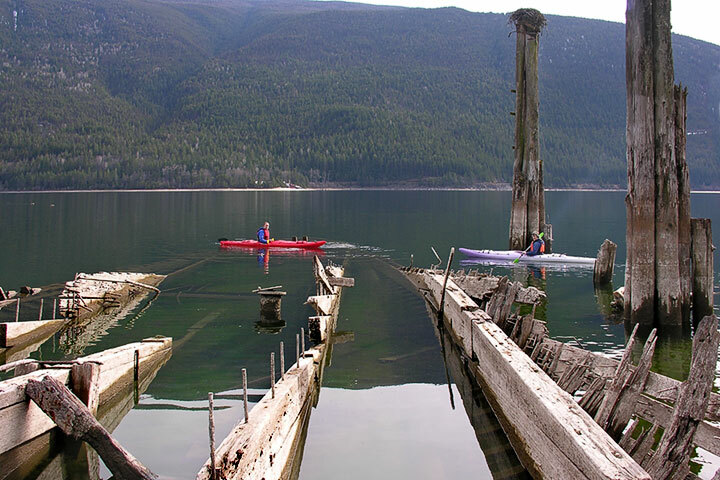 Launched in 1909, the S.S. Hosmer was the largest of the tugs operating on Kootenay Lake. In the days before the completion of the railway line from Procter to Kootenay Landing (1931), the Hosmer pushed barges of railway cars between these two points. The hull and its boiler are located on the south shore between Bealby and Horlick’s Points. 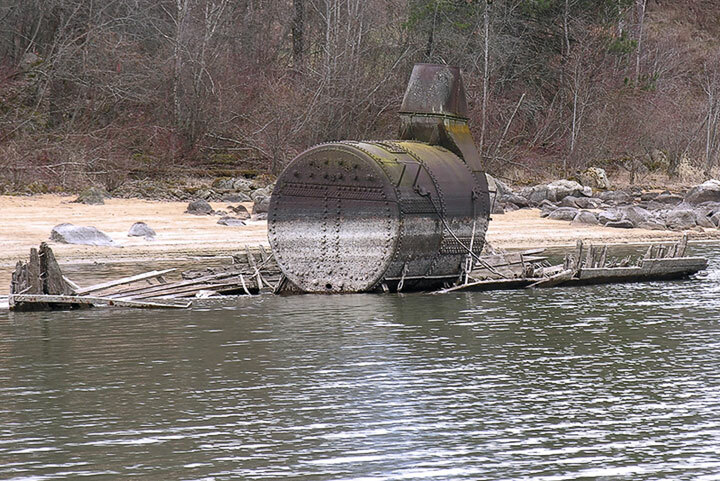 The boiler is visible even during the summer, but the hull is revealed only at low water.